Based on the real life love story between poet and author Joy Davidman and literary icon C.S. 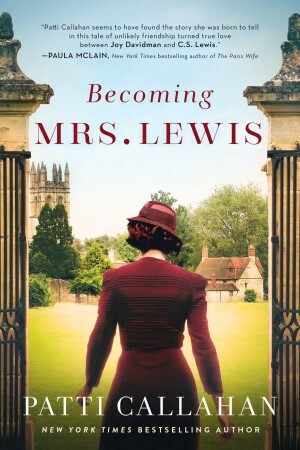 Lewis, Patti Callahan’s latest novel, BECOMING MRS. LEWIS, is the story of a woman, who, until now, has been overlooked by history, but who was Lewis’s best friend, editor and the only woman Lewis ever loved. Their improbable relationship, which began as a simple correspondence, led to some of the greatest works on love, grief and faith ever written by C.S. Lewis, yet Davidman is rarely given credit for being the muse she was to the beloved author. A brilliant writer herself, Joy was a novelist, a critic, a protégé of The MacDowell Colony, and a multi-award-winning poet. On paper, everything about her seemed ill-matched for an Oxford don and Christian apologist. She was an ex-Jew, ex-atheist, ex-Communist, married woman from New York, the mother of two young boys. It seemed an impossible pairing. Her circuitous journey from America to England, and back again, was fraught with heartbreak, poverty, risk, divorce, cross-ocean travel, fascinating friendships and great adventure. Largely rejected by his Oxford don friends, her love for Lewis never wavered. Joy was far more than the dying wife portrayed in Shadowlands and here finally is the true story of a frequently misunderstood woman. BECOMING MRS. LEWIS reveals Joy’s lion-hearted courage, conflicted and disparaged choices, as well as her abiding love for the man we know as C.S. Lewis, and his profoundly felt love for her, his best friend, and ultimately this once confirmed bachelor’s lover and wife.